The very popular, fast-growing pickup market welcomed the new generation light-duty Silverado 1500 and its near-twin GMC Sierra 1500 for the 2019 model year and the all-new Ram 1500 is also better than ever and ready to go against the best-selling Ford F-150. The fully redesigned half-ton Silverado is based on the new lightweight platform and body panels and comes with the modern styling. The interior benefits from additional cargo and comfort capacity. But with an array of the powertrain options including the turbocharged and diesel options, the new-generation truck is also ready to work. Chevy offers the new light-duty Silverado in eight trim levels and range of engine and transmission options. The various configurations and styling variants are also available and the off-road-focused versions occupy the mid-trim range. 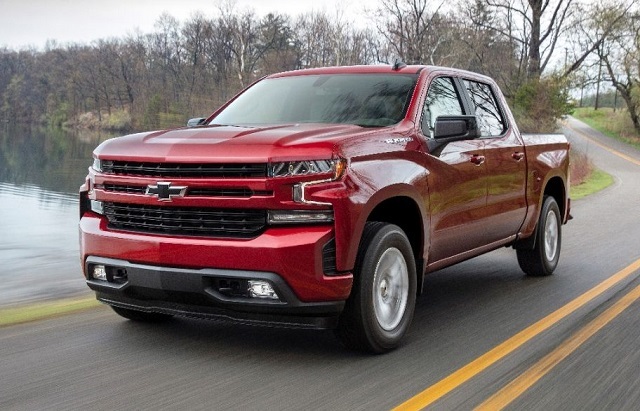 With the thorough redesigned and dozens of available configurations, Chevy hasn’t plenty of room for the further upgrades and the 2020 Chevy Silverado 1500 will be the carryover model. The changes in the equipment organization will make some options available in lower grades and broader color pallet should also appear. There won’t be any major improvements until the next mid-update. Ford pioneered the mixed-lightweight material design in the truck industry with the introduction of the current generation F-150 in 2014. Now the main rivals including GM’s trucks follow the same strategy. The fourth-generation Silverado 15000 has the high-percentage, high-tensile steel infusion in the chassis and some aluminum body panels. The new Silverado is also larger in almost all directions and provides more rear-seat legroom. Still, the overall weight is up to 450 pounds reduced compared to the previous version. With the modern structural improvements, the Silverado 1500 has also the new-decade, more muscular presence and improved aerodynamics. The 2020 Chevy Silverado 1500 version will continue to live on the recent upgrades and the same styling will stay until the next mid-update. For the new model year, Chevy will likely bring new color and wheel options while the special edition versions should also appear. 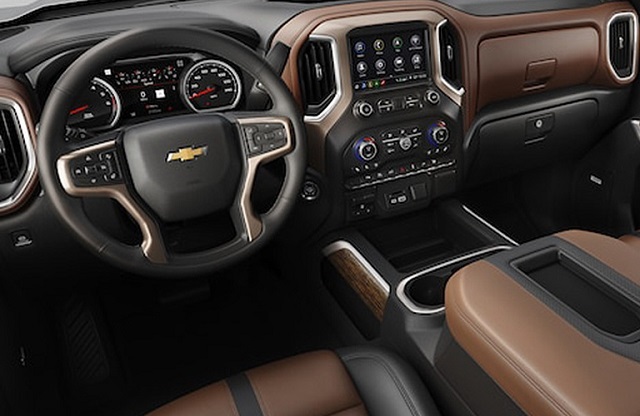 Chevy focused also to provide the higher quality and sophistication interiors for the redesigned model and improved also the interior comfort with 3 additional inches of the rear seat legroom in the crew cab versions. The truck has the blocky dashboard with the well-arranged and easy-to-use controls and offers also the latest tech and safety features. The next model year version won’t bring much more than the all-new 2019 version except Chevy might broad the availability of some features. The truck will offer the standard 7-inch infotainment interface with the smartphone compatibility and the available upgrade will be the 8-inch display option in upper grades. The model will also provide the WiFi connection, premium sound system, premium materials and high-luxury features. The same trim range and cab styles will return and the off-road-equipped version as well. The new-generation truck will also equip the latest safety tech. The list will include the surround-vision cameras, park assist, automatic emergency braking, lane keep assist, lane departure alert, blind zone detection and rear cross-traffic alert, etc. To the new model year, the 2020 Chevy Silverado 1500 will also continue with no surprises in the powertrain range. The engine lineup will start with the 4.3-liter V-6 unit combined with the six-speed automatic transmission. This option will provide adequate 285 hp and torque of 305 pound-feet. The Silverado 1500 will also offer the turbocharged four-cylinder engine. A 2.7-liter displacement with the 10-speed auto gearbox will be a good choice and provide 310 hp and 348 lb-ft of twisting. Another option with six-cylinders will be a 3.0-liter turbodiesel again in the combination with the 10-speed transmission. The diesel-powered Silverado 1500 will provide around 282 horsepower and torque of 450 lb-ft which should be the class-leading performance. Buyers will also be able to stay loyal to the old-school V-8 units. A 5.3-liter V-8 will come mixed with either six- or eight-speed automatic. The power will go up to 355 hp and torque to 383 lb-ft. The 6.3-liter V-8 will send 420 horsepower and torque of 460 lb-ft via the 10-speed automatic. The next 2020 Chevy Silverado 1500 won’t bring major modifications and the price range should stay close to the current area. The base model should go for about $33, 000 and the top-spec version should be around $58, 000. The market arrival will be in late 2019.